Individuals who want to add a splash of color to their on-the-go wardrobes might consider a selection of purple 17-inch laptop bags. Padding: First and foremost, a laptop bag must protect the machine. 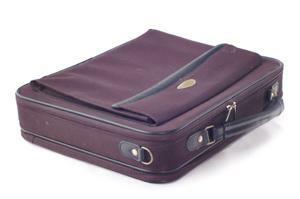 It should be extremely sturdy and durable, with thick interior padding to keep the laptop in place. The padding also prevents damage that might occur from a drop or other sudden movement. Strap: A strong shoulder strap is just as essential. A flimsy strap may snap or show signs of wear after a short period. Strong straps will support the laptop's burden - and then some. Compartments: The ideal laptop bag also offers some extra space for basic essentials, like the laptop's accessories, as well as office supplies and important paperwork. Laptop bags might be utilitarian, but they can also be extremely stylish. That is truer than ever now, when even high-end designers churn out their own splashy, colorful interpretations of laptop bags. Individuals who want to add a shot of color to their professional wardrobes or just want to have some fun might opt for a colorful bag. One of the more versatile and plentiful shades available is purple. Purple is one of those hues that appeals to men, women and youth alike. It is buoyant and playful, yet can just as easily appear sophisticated and polished. Purple is not limited to just one color variation; on the contrary, shades of purple run the gamut from light violets to rich plums. There are purple laptop bags available for laptops of all sizes, but an individual with a 17-inch machine may wonder if it's possible to track down a large enough style that suits his or her needs. In short, the answer is yes. If you're a professional in a very conservative environment, you may prefer a darker, more "royal" purple. If you're a college student, you might prefer something playful and bright to coordinate with your casual campus wardrobe. Look for light violets, lavenders and even styles etched with colorful prints atop purple backdrops. If you're shopping without concern for other factors, the sky is the limit as purple 17-inch laptop bags go. Believe it or not, the selection is quite impressive, and there are plenty of functional, attractive styles available. Fuji Depot: A bright option for anyone who loves fun accessories, this brand's 17-inch Purple Hibiscus Handled Laptop Sleeve is as useful as it is appealing. Etched with a pink hibiscus pattern atop a medium purple background, it is constructed of neoprene and features a spacious, padded pocket for small items. Inland Pro 17.3 inch Purple Notebook Bag: The bright grape color is fun, yet not overwhelming. It features handles and a roomy front pocket to hold the laptop's accessories. Laurex Laptop Backpack: A 17-inch laptop will slide comfortably into a supportive Laurex Laptop Backpack. This is a chic alternative to a basic laptop bag, and is available in a reddish-purple printed with a hummingbird design. Though its appearance is slightly youthful, it is a great choice for those who love to have some fun with their wardrobes. Sharpcase 17-Inch Laptop Bag: If you're seeking something simple and effective, look no further than this brand's 17-inch laptop bag. In a shade of soft mauve, it's perfect for a woman with a taste for all things sweet and girlish. Most laptop bags are built to accommodate the laptop size stated, but there is always the slight possibility that yours will be a tight squeeze. If you're unsure, don't hesitate to take your laptop with you to the store (or to enquire about an online retailer's return or exchange policy beforehand). Many sales associates are perfectly willing to allow consumers to test the product before purchasing it. Always take into consideration how much extra space you will need, as well. With these factors taken care of, you can peruse those purple bags to your heart's content.